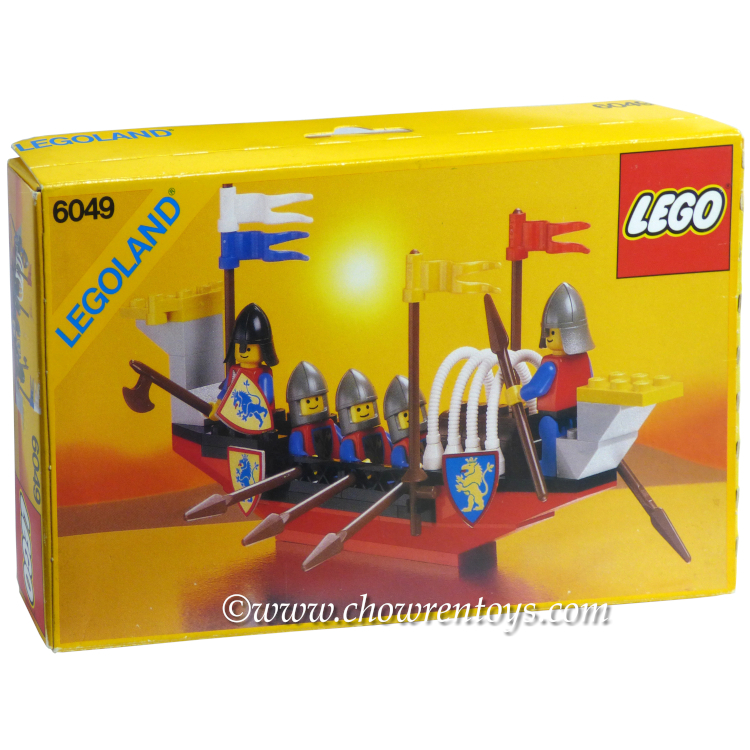 This is a BRAND NEW set of LEGO® Castle: Crusaders 6016 Knight's Arsenal from 1987. This set is still factory sealed and the box is in very good condition with minor shelf wear and a crease on one side of the box. 36 pieces and 1 minifigure©. 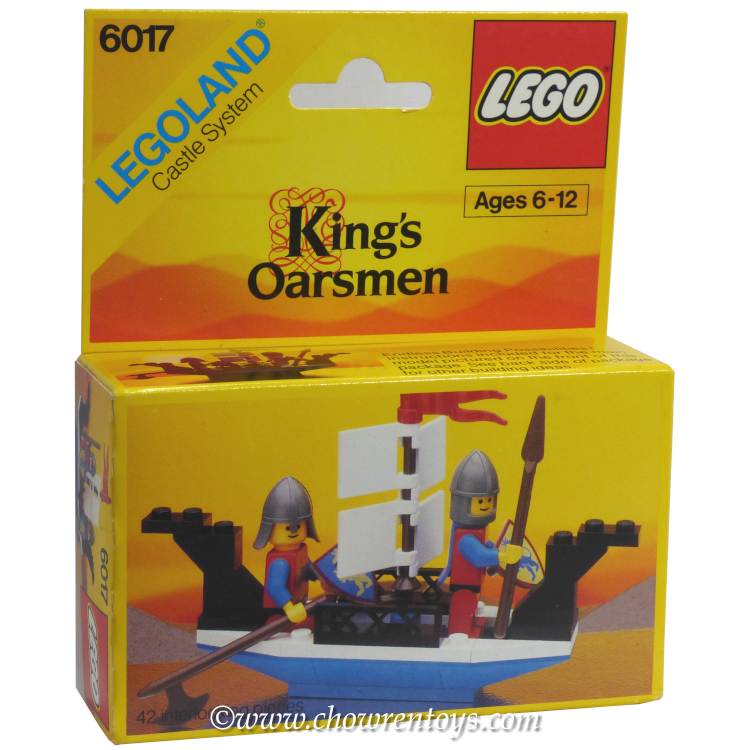 This is a BRAND NEW set of LEGO® Castle: Crusaders 6017 King's Oarsmen from 1987. This set is still factory sealed and the box is in very good condition with minor shelf wear. 42 pieces and 2 minifigures©. This is a BRAND NEW set of LEGO® Castle: Crusaders 6039 Twin Arm Launcher from 1988. This set is still factory sealed however, the box is in rough condition with a dent on one corner, a crease along one side, and a cut on another side. 73 pieces and 2 minifigures©. 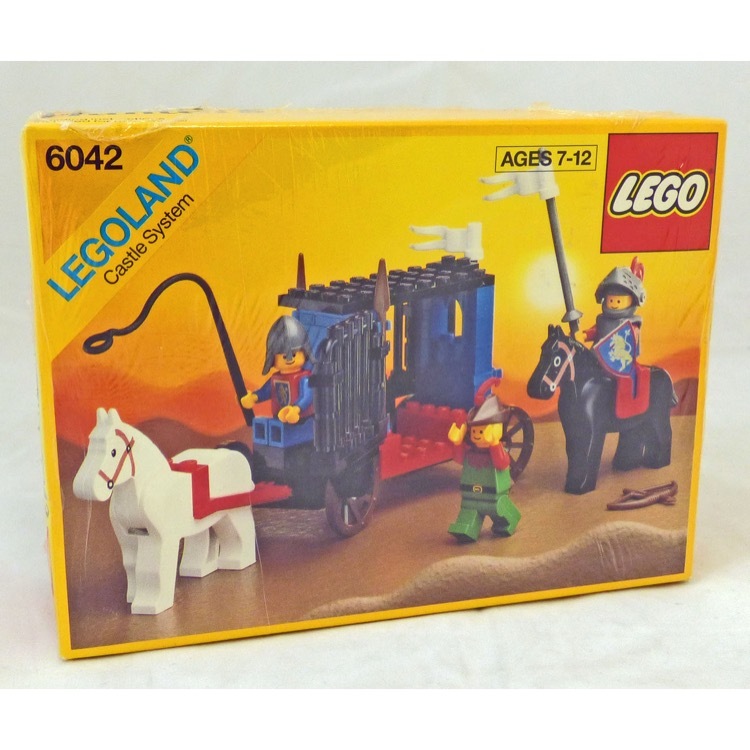 This is a BRAND NEW set of LEGO® Castle: Crusaders 6042 Dungeon Hunters from 1990. This set is still factory sealed and the box is in very good condition with minor shelf wear, however there is some writing next to the bar code on the box. 105 pieces and 3 minifigures©. This is a BRAND NEW set of LEGO® Castle Crusaders 6039 Twin Arm Launcher from 1988. This set is still factory sealed and the box is in very good condition with minor shelf wear . 73 pieces and 2 minifigures©. This is a BRAND NEW set of LEGO® Castle Crusaders 6049 Viking Voyager from 1987. This set is still factory sealed and the box is in good condition with minor shelf wear, however the back corner of the box has been pushed in. 94 pieces and 5 minifigures©. 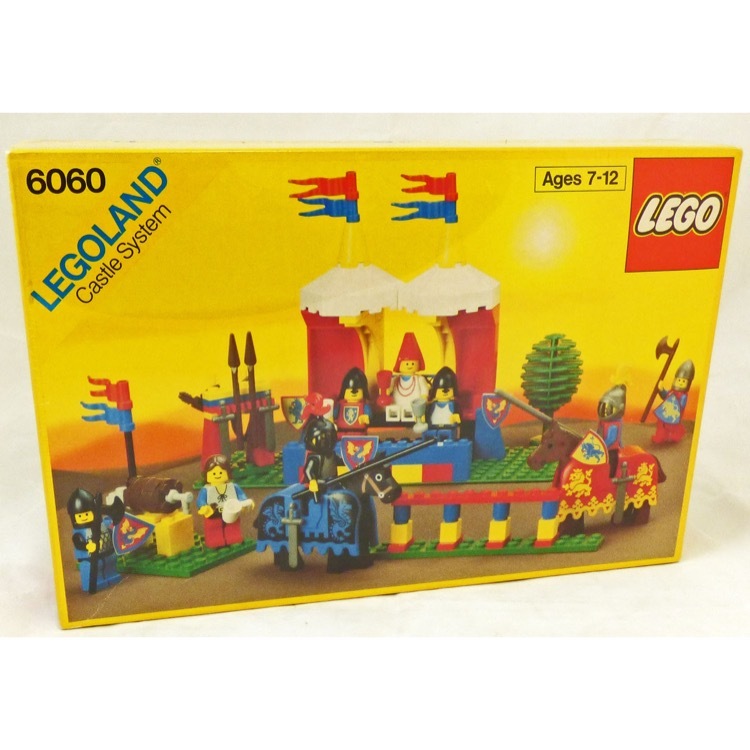 This is a BRAND NEW set of LEGO® Castle Crusaders 6060 Knight's Challenge from 1989. This set is still factory sealed and the box is in very good condition with minor shelf wear. 60 pieces and 8 minifigures©. 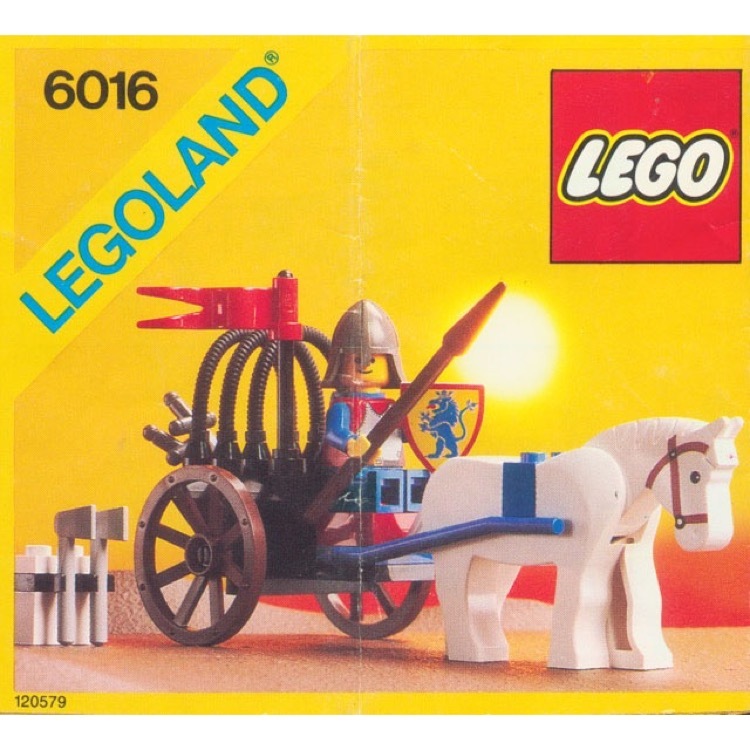 This is a BRAND NEW set of LEGO® Castle: Crusaders 6016 Knight's Arsenal from 1987. This set is still factory sealed and the box is in good condition with minor shelf wear, however the box has been pushed in and dented on one side. 36 pieces and 1 minifigure©. This is a BRAND NEW set of LEGO® Castle: Crusaders 6017 King's Oarsmen from 1987. This set is still factory sealed and the box is in good condition with heavy shelf wear and a small area of sticker residue on the front corner. 42 pieces and 2 minifigures©. This is a BRAND NEW set of LEGO® Castle: Crusaders 6042 Dungeon Hunters from 1990. This set is still factory sealed and the box is in very good condition with minor shelf wear, however there is a dent on the lower front corner of the box. 105 pieces and 3 minifigures©. 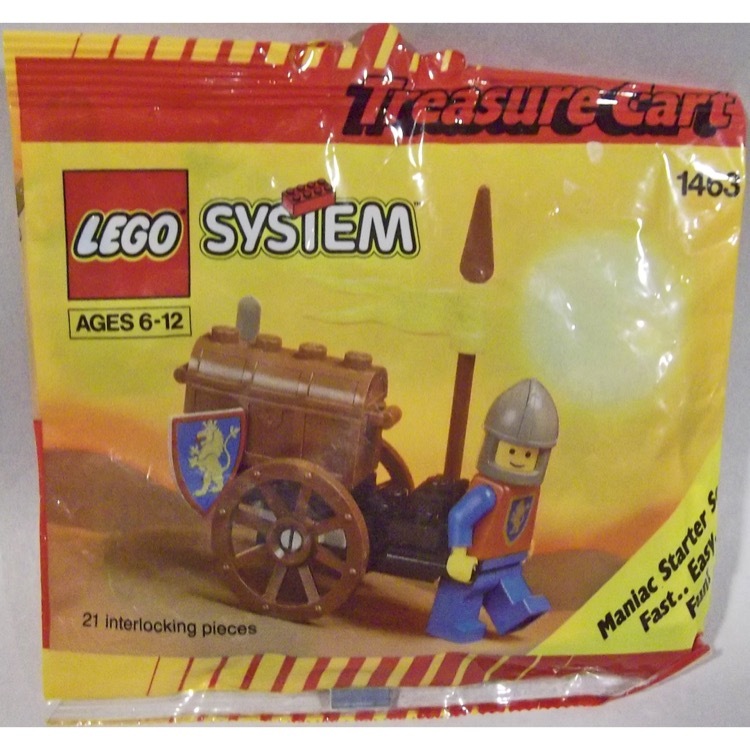 This is a BRAND NEW polybag set of LEGO® Castle Crusaders 1463 Treasure Cart from 1992. This polybag set is still factory sealed and is in very good condition. 23 pieces and 1 minifigure©.